Happy Kitchen Sink Stamp Monday! Thanks for stopping by, I hope you had a great weekend! We seemed to have missed all the snow this weekend, and I'm okay with that, I hope where ever you are, you're staying nice and warm. Important news from Kitchen Sink Stamps! I'm excited to tell you that Kitchen Sink Stamps will be getting a makeover in 2010! Starting Wed., Dec. 30th - Midnight EST., Kitchen Sink Stamps, Inc. will be "under construction" for a brief period while undergoing a fabulous Kitchen remodel for the New Year! Your favorite KSS bookmarks should still work just fine for this period of down time. Thank you in advance for your patience and understanding. Happy Holidays! But that's not all! 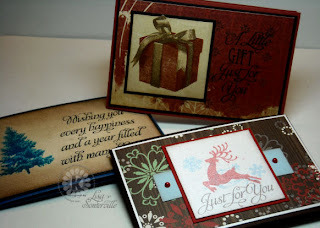 You won't want to miss Kitchen Sink Stamps After Christmas Sale! 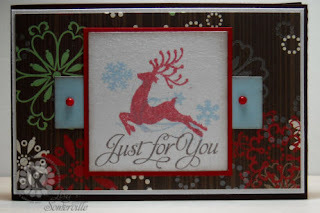 Put more jingle in your pocket with Kitchen Sink Stamps end of the year sale! Get 20% off everything in the Kitchen Sink Stamps store when you use code LISA20KSS from December 26th - December 28th, midnight to midnight EST. I just love the Sizzix Bigz XL Gift Card Holder Die (currently they are out of stock). These make creating gift cards a breeze. Of course I just had to squeeze in the Reindeer and Snow Flourish from the Year of Thanks II Tin. 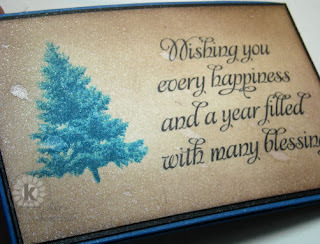 The sentiment is from Kitchen Sink Stamps Multi Step Gift. The image is stamped on the beautiful shimmery White Diamond card stock from Paper Temptress. Now on to more of a vintage Gift Card Holder. I used the Burnt Edges Technique on the background. 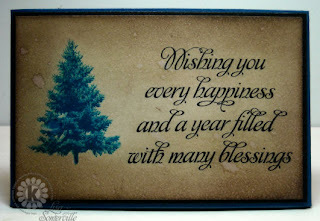 Then stamped the sentiment from the Multi Step Hanukkah in Black Ink, and the Trees from the Multi Step Pines. After the inks dried, I lightly misted with Pearl Glimmer Mist. Again, going for more of a vintage feel. I used Cosmo Cricket pattern paper for my background, stamping the sentiment from the Multi Step Gift plate in Black using a SAMJ. 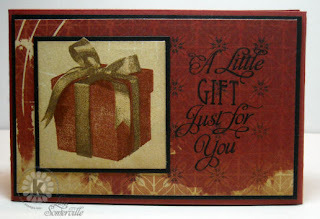 The gift is stamped on the backside of a piece of Cosmo Cricket paper, then cut using the Out of the Box Technique. DH: oh those are nice, but they are all white. ME: I know, I bought some this year, got a box of 18 on clearance for $2.00, it saves me time and money. DH: I can't believe you bought cards, that's what you do. ME: I know, just sign them. On a side note, I did hand him a stack of cards I stamped too. I created a ton of Holiday cards this year, thing is I sold just about all of them, and at this late date, just don't have time to create more. I think I better start on next years cards now! Oh wow, Lisa! These gift tags are all so AMAZING!! Love each and every one of them...the perfect addition to any package!! You have been seriously busy creating some of the most beautiful Holiday cards ever! Thanks for a year of wonderful inkspiration, challenges...and of course "enableing" lol! Merry Christmas to you and your Family! I love your stunning vintage holiday cards, Lisa!! What gorgeous work!! Wishing you and your family a Christmas filled with peace, love, and the joy of the season!! Those are just gorgeous, Lisa! I love the vintage look! Lisa, love the conversation piece!!! Sounds like my house. Those are great Lisa! Now wish I had bought that die! I almost broke down & bought cards too, but just couldn't do it. Of course, the majority are still not assembled, so they're gonna be late... and no pix this year either; just couldn't get it done.